Classic song from the ´70s! 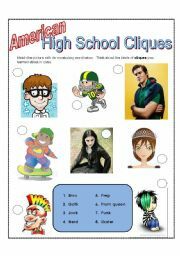 I made this worksheet to introduce the 1970s and disco era to my students. The song is very fast, but I played a youtube video with the English lyrics. 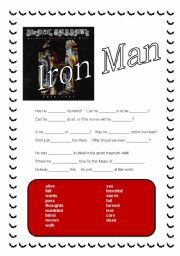 Students were able to complete the worksheet after listening three times. 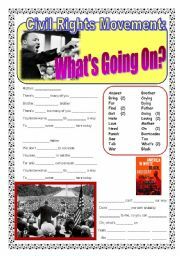 My students listened to the "All Star Tribute" (MTV version on youtube) of "What´s Going On" to discuss the 1960s and the Civil Rights Movement. They enjoyed the song very much, especially because it helped them understand what people like Martlin Luther King, Jr. were thinking during that time. It can also be related to the Vietnam War. I used this to introduce the 1950s and rock-n-roll to students. It is a popular, fun song from Mr. Presley. 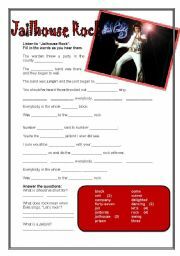 My students enjoyed listening to Elvis and learning what "rock and roll" is. They also enjoyed the "jailbird" and "jailhouse" vocabulary. Enjoy! 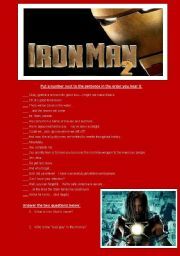 I made this matching activity for the new "Iron Man 2" movie trailer. Students should put the quotes in the order that they hear them. Here is the youtube video I used: http://www.youtube.com/watch?v=siQgD9qOhRs. The English is very fast, so I had to pause and play it several times. Great activity for boys and/or teenagers! 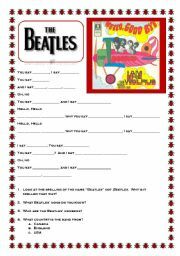 This is a worksheet for the song "Hello, Goodbye" by the Beatles. I used to share culture of the 1960s and introduce great rock bands. 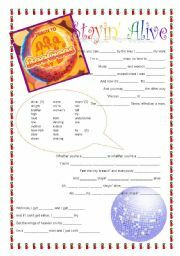 The song is very easy to understand and great to incorporate greetings in English. Enjoy! This is a speaking evaluation rubric based on which of my students´ skills I wanted to assess. The students did an oral presentation in teams. Most important was the students´ speech and sharing of responsibility. I wrote comments in the boxes, which was a bit time consuming. Hope this is helpful to you!